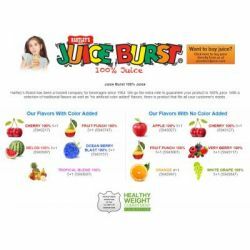 Juice Burst 100% JuiceHartley's Brand has been a trusted company for beverages since 1964. We go the extra mile to guarantee your product is 100% juice. With a selection of traditional flavors as well as "no artificial color added" flavors, there is product that fits all your customer's needs. Our 100% Juice Inspection ProcessWith growing concerns over FDA guidelines for 100% fruit juice and the FDA's overwhelming list of regulatory products to oversee; the process in reviewing, testing, updating guidelines can be a lengthy process. We believe as a manufacture of 100% fruit juice concentrate, we need to take measures to ensure our customers feel confident that the juice you serve, meets your expectations. That is why H&H Products Co. has been taking extra steps to give our customers the assurance that Hartley's Juice Burst 100% juice concentrate is meeting those expectations. 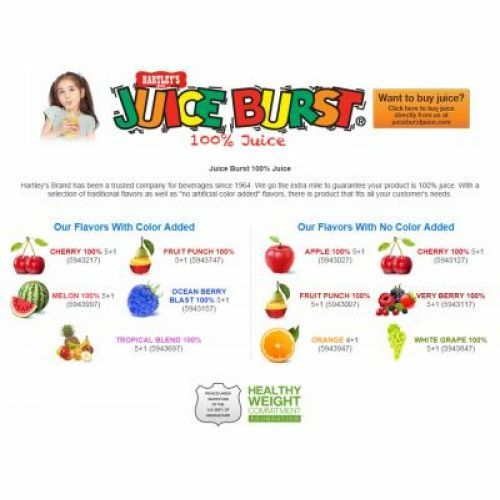 Every batch of Hartley's Juice Burst 100% juice concentrate we manufacture is blended and bottled with the USDA Inspector on sight, testing each batch to ensure you are receiving 100% juice when properly reconstituted. When you see the USDA Inspection Shield of Approval on the bottle, you will know your bottle of Hartley's 100% Juice Concentrate has been tested to meet the USDA standards of 100% Juice Concentrate.Hartley's 100% Orange Juice does not contain a USDA Inspection Shield of Approval and all the other flavors do, why? California and Florida are the only U.S. states in which manufactures must have each lot of their citrus products (containing 20% juice or higher) inspected by the USDA. This is a mandatory inspection, not voluntary like our other 100% juice concentrate products, therefore the shield is not necessary. No Orange Juice will leave our facility without prior approval from the USDA.Packed: 6 1/2 gallon bottles per caseShelf Life: 6 monthsProduct Storage: Store concentrate in a cool, dry place. No refrigeration necessary before or after opening.